Hi, I am interested in your 1968 Plymouth GTX (stock #5075-CHA) listed on Autotrader for $47,995. I'd like to get more information about this vehicle and confirm its availability. 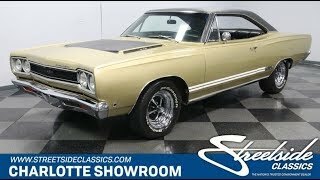 The 1968 Plymouth GTX was a premium muscle Mopar that was all about show and go. So you know its something special to find one of these rare coupes thats been restored to uphold its legacy right down to the 440 big block under the hood. The GTX was the gentlemans muscle car. Many people were not willing to go to the expense of premium rapid transit, and instead opted for its Road Runner sibling. Today that makes the GTX one of the most respected and rare Mopars around, so you are already going to gain gawkers from far across the car show field. As they get closer, the compliments will start with the paintwork; and youll be able to tell them its a respray of the factory-correct T-code Avocado Green Poly. Theyll start to admire the golden glow, and the extra shine from the wide bumpers and polished mag wheels. And we all love the double side stripes that draw attention to the special GTX badging. Plus, theres a very well-coordinated dark side with the flat black hood, full-length black pinstripe, and premium black vinyl roof. All the black accents on the outside are also a nice preview of the inside. Almost everything you can see or touch feels like its 1968 all over again. This includes the intricate seat covers, artful steering wheel, and even the AM radio is still on display. Theres wood paneling on the doors, dashboard, and center console to remind you this is a premium GTX. Theres plenty of room for family and friends, but one hint of that rumbling exhaust soundtrack, and you know this Mopar muscle machine is all about the driver. This was born a 440 car, and so its great to see that displacement still under the hood today. The big V8 looks bold against the exterior-matching engine bay. And the presentation is quite correct, right down to the decals on the Magnum air topper. So you know they made the proper investments in the engine bay during restoration. Topped with a four-barrel carburetor, this big V8 fires up readily with the ferrous noise you expect from a street king like this. While this coupe sounds intimidating, its quite nice to drive. Torqueflite 727 three-speed automatic and power brakes w/discs up front give this a fine presence on the road. Plymouth made less than 18,000 of these hardtops in 68. How many do you think are this nice over a half a century later? Dont take too long to answer that question, because you know an exceptional Mopar like this will be gone soon. Call now!